This blog has been used for a number of years as a running record of the Communist University postings. It contains a record of the full, four-year, 16-course cycle of the CU. It also contains an archive of the historically-interesting years from 2005 to (early) 2010 when the CU blog was more of a general magazine and running record of current events. It can be searched, and browsed. Links at the top of this page remain useful in different ways, and can be edited. In other respects, this blog will now be left as it is. Up-to-date versions of the courses will be found on the new archive site. It is still possible that new courses could be developed for the CU, but it is not very likely to happen in the near future. The 16-course division of the material is comprehensive, convenient and stable, providing a four-year cycle which is run on four parallel channels, and so is completed every year, taking the four channels all together. Therefore is no longer necessary to repeat the posting of the courses to the blog. It is true that the courses are edited and updated as they are sent out, so changes do occur. These changes can be picked up from the new archive, linked above. This blog can now rest, and remain as a semi-static resource. Feel free to explore it. Attached and linked below is an article by Samir Amin on China, which can serve to finish off our course on Anti-Imperialism. This article creates a picture of where the National Democratic Revolution takes a country, if care is taken with the alliance that the NDR depends upon. The Chinese communists have taken good care. More than this, the article is in effect a comparative critique of all of the post-20th-century states, and more especially of the other BRICS countries: Russia, India, Brazil and South Africa. The article deserves to be read, and read again at intervals. It is a comment by an African revolutionary intellectual on the world as it has been, is and will be for a long time to come. One piece of unfinished business left by this article may be the definition of socialism. The difference between the proletariat and the peasantry is not, as Samir Amin correctly notes, that one has no use for property, while the other craves property above all. These are caricatures. The more functional difference is the one pointed to by Marx in his “18th Brumaire”, with his unforgettable phrase “sack of potatoes”, used to describe the relation of peasant families to each other. Whereas the proletariat has learned two things in its harsh relationship with capital: discipline and social organization. The social division of labour that is characteristic of the proletariat is what is otherwise called the socialization of production under capitalism. It is the material root of the idea of socialism. Socialism means the integration of people over larger and larger fields (village, town, city, nation, world). If it is only de facto, it may in practice be imperialism or it may be “globalization”. The word “socialism” is not precise. This is clear from the Communist Manifesto of 1848, where Marx and Engels talk of feudal socialism and bourgeois socialism, among others. Socialism is only society organised as a unity, and not as a “sack of potatoes”. The proletariat is the most socialist class because of its highly developed and explicit divisions of labour. Communism is a more precise word. It just means a classless society. Inherent in the idea of communism is escape from capitalist relations of production. For all that Samir Amin has to say about state capitalism, and correctly, he does not say this much. But the initial reason why post-revolutionary production must be “state capitalist” is only that there is no other relation of production available. So the move of hundreds of millions of Chinese people from the rural areas to the new cities is bound to be a move from peasant, more-or-less self-sufficient family production, towards wage labour. Seeing it as a move from the smallholding to the factory is maybe an over-simplification. But the absence of an alternative way of organizing production other than the notional factory, is a reality. The present absence of an alternative set of relations of production appears to be the reason why the Chinese will say that they don’t expect “socialism” (probably in this instance meaning communism, the classless society) for another 200 years. The relationship between the proletariat (the hammer) and the peasantry (the sickle) is not a relationship of like with like, but it is a relationship of different classes. In South Africa, the urban survivalists, and the small businesses, have to some extent replaced the peasantry, but they are also not strictly proletarian. Slogans that include the words “workers and the poor” can obscure this distinction, or illuminate it, depending how they are used, and understood. Intelligent communist-party leadership is the essential ingredient in the National Democratic Revolution. Samir Amin gives ample evidence and argument for this assertion. · The above is to introduce the original reading-text: China 2013, Samir Amin. Massacre at Cassinga. War no more. War is a terrible thing. War is never a choice for the revolutionaries. We are not pacifists but we do not choose war and we do not choose to be banned or clandestine. We are for peace and for full participation in all democratic forums. The Cassinga massacre of 4 May, 1978, is now nearly forty years in the past. For some of us it was once an event in our present life, very shocking for us because we had though that such horrors were already in our past by the time. For others now living, the Cassinga massacre is now so much in the past that it may be a struggle to see what a huge significance this terrible event had. Please read the attached document. Perhaps this reflection, and by extension this entire course, is a way of saying that it falls upon all of us, young and old, to strive politically so that such things do not happen again, and will not require again the militarisation of our struggle, here in Southern Africa. 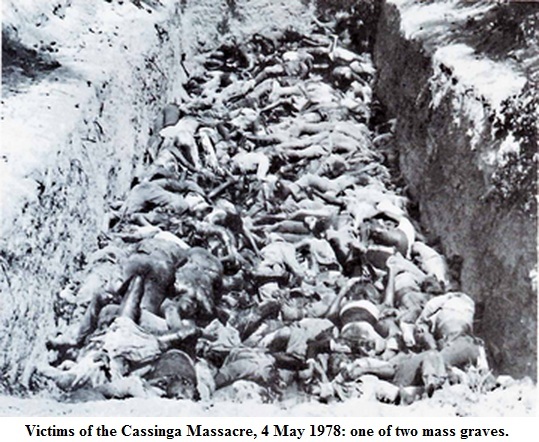 · The above is to introduce the original reading-text: The Massacre of Cassinga [and after] Piero Gleijeses. In political education, our method is to remove ourselves in place and time. We go to the “classics” and to authors of the intermediate period, and we study other places, in the past or in the present. All of these provide us with examples. The examples provide us with a theoretical and practical “sandpit” that gives us a “codification” or in other words a basis upon which we may have a common dialogue. Dialogue is where political education happens. Anything that can provide an occasion for political dialogue is good for education. Our own history can be used, but what do we find? When looking for history of our liberation struggle, and the history of the armed struggle in particular, we find very little. The materials about the culminating struggle in Angola assembled below will have to suffice for now. They can also serve as a small contribution towards recognising the Cuban and Soviet comrades who fought faithfully and often fell for us, until victory came. Vladimir Shubin has written and published two books in English: “ANC: A View from Moscow” and “The Hot 'Cold War’: The USSR in Southern Africa”. These books are presently available from bookshops in South Africa, or they can be ordered via the Internet. The Soviet record of events does not correspond in every respect with the Cuban record, and this contrast would force the readers or students to make judgements of their own, as to what was really the critical path that led to the final political result, which was victory in Angola, Namibia and South Africa. Let us hope to find a suitable Soviet or Russian article in electronic form, soon. Fidel Castro has written a lot. Linked below, as our main item, is the speech he made on 2 December 2005, on the occasion of the 30th anniversary of the first Cuban expeditionary force to Angola, which became what the US Imperialist diplomat Chester Crocker called an “unprecedented projection of power”. 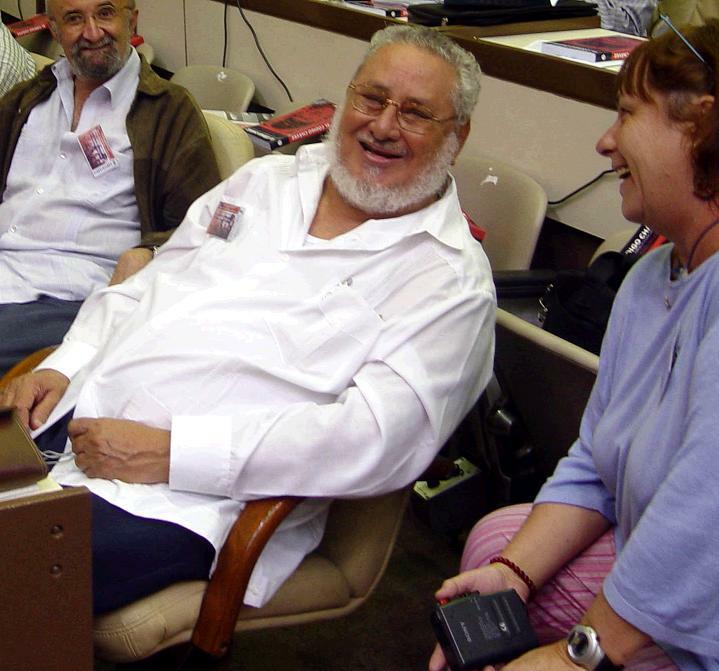 Jorge Risquet Valdés Saldaña, fighter, negotiator, and currently member of the Central Committee of the Communist Party of Cuba, has written (in Spanish) “El Segundo frente del Che en el Congo” (ISBN 959-210-412-3, Casa Editorial Abril, 2006) – the history of the Patrice Lumumba Battalion, in which Risquet served. The picture above is of the same Jorge Risquet, a great and brave hero, also famous for his friendliness and joie-de-vivre. The person seen to the left of Risquet is Piero Gleijeses, of whom more in the next item. · The above is to introduce the original reading-text: Thirty years after Angola and 49 after Granma, Fidel Castro. Mahmood Mamdani’s “Citizen and Subject” (downloadable extract linked below) maps the relations of four class-based powers in the anti-Imperial struggles in Africa: Bourgeois, Proletarians, Imperialists and “Traditional Leaders”. The (national) Bourgeois and the Proletarians are the modernisers and the democrats, who are compelled by necessity to combine together to fight for the democracy that forms the nation. Capitalism has failed, and Imperialism has failed. In South Africa, capitalist Imperialism arrived more than 114 years ago, and it never delivered to the people or even employed more than a fraction of them at any time. It started bad and it got no better. Recently it has gone from a boom from which the masses somehow failed to benefit, to a recession that will last for years. What’s new? The same excuses have been there all along. Maybe it is truer to say that Imperialism didn’t fail: it only lied. It was never going to deliver, and it never will. 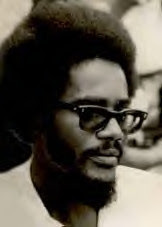 Like Issa Shivji and Walter Rodney (author of “How Europe Underdeveloped Africa”, also downloadable in [1069 KB] PDF format by clicking here), Professor Mamdani is a cadre of the famous Dar-es-Salaam campus. Mamdani is now Director of the Makerere Institute of Social Research (MISR) in his native Uganda, and has previously served in many capacities including at Columbia University, New York, USA, and the University of Cape Town, South Africa. Note that Mamdani's sense of the word “subject” in this work is different and opposite from the usual communist, or philosophical one. Here it means a subordinate person, like for example the subject of a king, and not a free person. 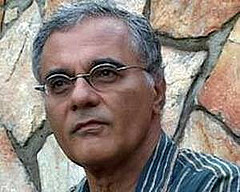 In the book, Mamdani’s principal insight is to recognise the class alliance typically sought by the Imperialists in neo-colonial Africa countries. According to Mamdani, the Imperialists prefer to ally with the most backward rural feudal elements (often called “traditional leaders” or “chiefs” in Africa) in opposition to the modernising bourgeoisie and proletariat of the cities and towns. Mamdani regards South Africa as the classic case in this regard, although he quotes many other examples. Mamdani’s analysis stands in contrast with a common presumption, namely that the Imperialist monopoly-capitalists tend to work through “compradors”, who are local aspirant bourgeoisie, or bourgeoisie-for-rent, who do the Imperialists work for them. Such compradors do exist, and clearly they exist in South Africa. Yet Mamdani’s scheme reflects the facts and history of Imperialism in Africa better, at least up to now. Imperialism is in general hostile to the national bourgeoisie. The typical neo-colonial war of recent decades, including the Iraq war, the long war against Afghanistan, the war against Libya, and the war against Syria, is a war of Imperialism against a national bourgeoisie that wants national sovereignty and control over its country’s national resources. In the light of this analysis it becomes easier to see why it is that the South African proletariat has long been, via the ANC, in alliance with parts of its national bourgeoisie, for national liberation, against the monopoly-capitalist oppressors with their Imperial-globalist links. The Imperialists make a marriage of convenience with the most retrogressive social power that they can find – tribalism – in a pact to hold Africa where it was under colonialism: partly rich, but mostly dirt poor. In South Africa the Imperialists relied heavily on Bantustan leaders and on the Inkatha Freedom Party, but the ANC was able to form better links with the rural as well as with the urban masses, thus achieving a class alliance that could, and in fact did, dominate the country in terms of mass support. 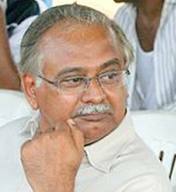 · The above is to introduce the original reading-text: Citizen and Subject, Chapter 8, 1996, Mamdani. This part is the second-last in the present series on Anti-Imperialism, Peace, and Socialism. This part is designed to invite comrades to reflect upon the place of the anti-Imperialist struggle within the entirety of world history. That is why Issa Shivji’s address on The Struggle for Democracy and Culture (linked below) is used. It explicitly and correctly claims, on behalf of the national-liberation and anti-colonial struggle, that for the time being this national democratic revolutionary struggle carries the banner of progress for the whole world. For a long time past, and into the future, until such time as the struggle for socialism itself becomes once again the principal one, the National Democratic Revolutions taken together constitute the main vehicle for human progress, bearing, and rescuing, all that is noble and fine in humanity. The bourgeoisie is a thieving class and it will steal the clothes of the revolutionaries without any hesitation if it sees the smallest, most temporary, advantage in doing so. The Imperialist bourgeoisie wishes to reverse the appearance of its shameful past and of its hopeless future. It wishes to claim the moral superiority that the liberation movement has, and steal it. Issa Shivji, the revolutionary Dar-es-Salaam intellectual, shows very clearly how the monstrous fraud is attempted. The constant droning about “good governance” is the extreme of hypocrisy, coming as it does from the worst oppressors in history – the force that has taken oppression to the ends of the earth – Imperialism. Read Shivji. He tells it well. But also note the hypocritical machinations of our present South African anti-communists, including but not limited to the DA. If you did not know better, you could start to believe from what you read that it was liberal whites who liberated South Africa from the old regime. The struggle for democracy is ours, not theirs. The struggle for freedom is ours. We are the humanists now. We, the liberationists, are the principal creators of human history, and we have been for many decades past. The 20th Century was the liberation century and the first anti-Imperial century. That was when we overtook the others in politics, in morality, and in philosophy. But we were only starting. In the 21st Century we will finish the job, and finish with Imperialism altogether. · The above is to introduce the original reading-text: The Struggle for Democracy and Culture, 2003, Shivji. “the US decision to drop atomic bombs on Hiroshima and Nagasaki ... was meant to kick-start the Cold War [against the Soviet Union, Washington's war-time ally] rather than end the Second World War”. This statement is taken from Norm Dixon’s article “Hiroshima and Nagasaki: Worst terror attacks in history” published in Green Left Weekly, August 3, 2005 (attached; download linked below). The two worst-ever terrorist attacks in history, by far, were perpetrated by the USA, and for the most cynical and mendacious reasons. 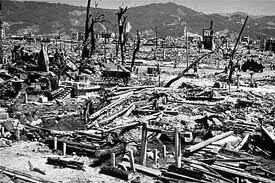 Images of what resulted in Hiroshima and Nagasaki are abundantly available on the Internet, but the ones that show people, whether alive or dead, are too terrible to use here. To this day the USA does not face up to what it has done by these two vile acts. This course is on Anti-Imperialism, War and Peace. We cannot leave this thing out. We have to note that the US power that did these unspeakable things is still active in the world, and is still, as it was then, active in the cause of its own dominance over the rest of us. The list of its crimes continues to grow longer every day. · The above is to introduce the original reading-text: Hiroshima, Nagasaki, Worst Ever Terror Attacks, Dixon. First they came for the Communists, but I was not a Communist, so I said nothing. Then they came for the Social Democrats, but I was not a Social Democrat, so I did nothing. Then came the trade unionists, but I was not a trade unionist. And then they came for the Jews, but I was not a Jew, so I did little. Then when they came for me, there was no one left to stand up for me. The third attached and linked document in this part opens up the double question of who backs the communists, and if the communists are not backed, then what happens to the others? This is the question of self-defence for the political movement, the importance of the communists, and of the non-communists. Pastor Niemöller’s story is extraordinary, and unexpected. This German anti-Nazi Pastor survived Dachau. 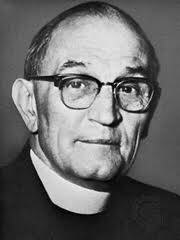 For revolutionaries it is very moving to record the solidarity of people such as Pastor Niemöller. The revolutionaries must trust the people. They have no choice. · The above is to introduce the original reading-text: First They Came For The Communists, Niemoeller. The second linked document is included in this part because of Osagyefo Dr Kwame Nkrumah’s correct and insistent concern with the continuing threat to Africa (now materialising again militarily as “US Africom”) posed by Imperialism in its last stage of neo-colonialism. 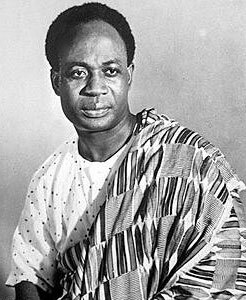 Nkrumah believed that Africa must unite, for the sole reason that if it did not unite, then it would not have sufficient strength to resist the Imperialists. And so it has turned out. “In the earlier chapters of this book I have set out the argument for African unity and have explained how this unity would destroy neo-colonialism in Africa. In later chapters I have explained how strong is the world position of those who profit from neo-colonialism. 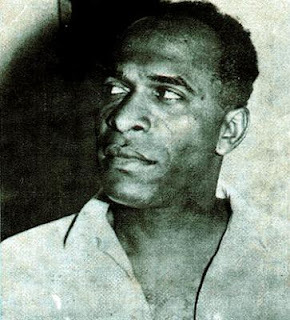 · The above is to introduce the original reading-text: Neo-Colonialism, Last Stage of Imperialism, 1965, Nkrumah. Exactly how the anti-Imperialist struggle will resolve itself in South Africa, Southern Africa, and Africa in general, is something unpredictable at the tactical level. The question of the armed defence of revolutionary change cannot be ruled out, and we have examined this question. This part of the present series, referenced to the “Beyond Vietnam” speech (attached, and linked below) of the late Rev Martin Luther King Junior, is designed to point to the subjective political factor in the anti-Imperialist struggle. Nowadays it has become commonplace to refer to “international solidarity” as not only a specific, but more so a universal idea. But this concept that we have largely stripped of its particularity, generalising it as a formula, does actually have a tremendous history whose meaning is not fully conveyed by a stock phrase called “international solidarity”. The anti-Imperialist struggle and the democratic struggle can and should be one. It is not a matter of charity of the rich to the poor. It is also not solely a matter of good-hearted and exceptional individuals. 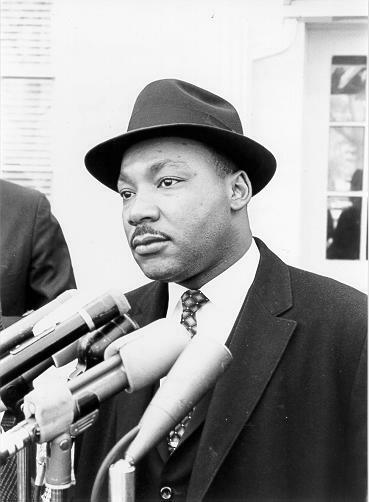 But there have indeed been such individuals – “MLK” was one of them – and there will be again. In other words, MLK at the meeting of the “Clergy and Laymen Concerned about Vietnam”, in 1967, was preaching the intrinsic, organic unity of the struggle of the common people everywhere. It is not an artificial altruism, but it is a unity of purpose, in concerted action against the single enemy that manifests itself everywhere and oppresses us all: monopoly-capitalist Imperialism. And further than his literal message, there is also the extraordinary power and style of MLK’s oration. We forget this factor of art too easily. Lenin spoke of “insurrection as an art”. It is an art that goes beyond the military, and encompasses all of our activities. Therefore when reading such a piece as MLK’s “Beyond Vietnam” speech, one should regard it as a source of learning of the art of advocacy, which is part of the art of leadership, essential to the art of insurrection. “Now let us begin. Now let us rededicate ourselves to the long and bitter, but beautiful, struggle for a new world. This is the calling of the sons of God...” – Martin Luther King. 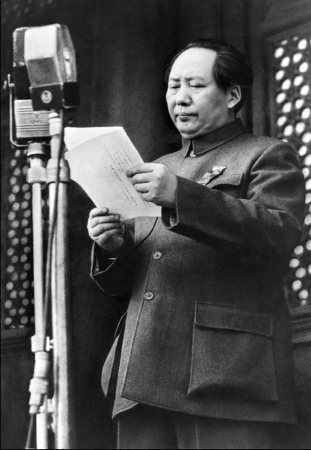 · The above is to introduce the original reading-text: Beyond Vietnam, Time to Break Silence, 1967, King. The ANC’s famous 1969 Strategy and Tactics document adopted in the Morogoro, Tanzania Conference involving O R Tambo, Joe Slovo, Chris Hani and others, is attached, and downloadable from the link given below. As a classic, the Strategy and Tactics document can speak for itself. It is straightforward enough. This document, like, for example, the Freedom Charter, remains one of a handful that are held in the highest regard by the South African liberation movement. It is a typical document of National Democratic Revolution. It is short. It is really a “must-read” for any student of SA revolutionary politics. It has implications for today. · The above is to introduce the original reading-text: Strategy and Tactics, Morogoro, 1969, ANC. The practical alternative to the State that appeared in Paris in the beginning of 1871 was not only the right of recall, and the whole people collectively in power and in perpetual session. It was also the reappearance of the Armed People in a new kind of societal framework. So-called Primitive Communism is an Armed People. Here, in the Paris Commune, was an Armed People in advanced productive circumstances. The security forces - army and police - that had existed before the Paris Commune had been paid to support the bourgeois State and to guarantee the State’s survival by suppressing, whenever necessary, the working class. Under the Commune, these forces were disbanded and not replaced. With hardly any exceptions, all “separations of powers” were abolished in the Paris Commune, leaving only one power: The Armed People. In Chile, in the time of the Popular Unity government that fell on 11 September 1973, instead of an Armed People, a virtue was made of disarmament, and a “Peaceful Path” was worshipped as the new political Golden Calf. Volodia Teitelboim, in the document attached, and linked below, gives a brief description, as one of those who was involved, of Chile’s Popular Unity government and its disastrous end at the hands of traitor fascists who used the national army to overthrow it. It was a shocking reminder of the purpose of the “special bodies of armed men” of the bourgeois state. Teitelboim calls for “A Reappraisal of the Issue of the Army,” meaning a return to the view of the Paris Commune, which Teitelboim mentions in the first line. This document is a sufficient basis for a very good and necessary discussion. Like the Chilean Popular Unity government, ours is a multiclass government underpinned by a class alliance for common goals. It is a unity-in-action, otherwise called a popular front. Why have we in South Africa survived after 21 years, while the Chileans did not survive after only 1,000 days? The answer could be that we are not pacifists. Or, the answer could be that our crisis has not arrived yet. Or, that we have passed at least one crisis (e.g. in mid-2008, resolved by the recall of President Mbeki and the resignation of various ministers including Terror Lekota and Mluleki George), which may not yet be the last. The next featured text will be the ANC’s original Strategy and Tactics document of 1969. It unashamedly embraces armed struggle, and not any starry “Peaceful Path”. South Africans were in this case in advance of the historic crisis that manifested in Chile. 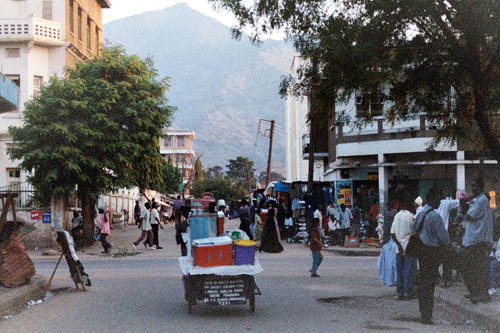 Four years prior to the Pinochet coup in Chile overthrew the Popular Unity government led by Salvador Allende, the Morogoro Conference of the ANC had laid down the necessity for the armed defence of the revolution. Picture: There are very few photographs of freedom fighters in formation or in action to be found on the Internet, whether of MK or any of any other liberation army; but there are many photographs of freedom fighters in captivity. Full justice has not yet been done. The picture is of a statue of Dedan Kimathi under the blue sky of Kenya. AMANDLA! UHURU! · The above is to introduce the original reading-text: 1,000 Days of Popular Unity Rule in Chile, 1977, Teitelboim. I am a Communist because I believe in Freedom.